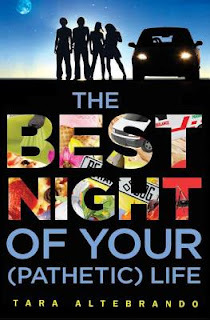 Reading Tara Altebrando’s The Best Night of Your (Pathetic) Life, I couldn’t help but think…aren’t we long overdue for another resurgence of teen movies? The 80s – the so-called ‘Golden Age’ of teen movies - gave us everything from ‘Fast Times at Ridgemont High’ to ‘Sixteen Candles’ to my blog’s namesake, ‘Heathers,’ and then ‘Clueless’ kicked off a new slew of teen movie love in the mid- to late 90s including ‘Never Been Kissed,’ ‘Can’t Hardly Wait,’ and ’10 Things I Hate About You.’ Were those not THE BEST?! If you’re not familiar, there’s always Netflix…just sayin’. Some of you may be thinking, “But what about the ‘Twilight’ series? And ‘Hunger Games’?” Yeah, yeah, yeah, but I’m thinking more along the lines of those old school movies that explored everyday high school life with its cliques, crushes, cool clothes, and ALWAYS killer soundtracks. The Best Night of Your (Pathetic) Life certainly reads like one of those teen flicks. Every year during Oyster Point High School’s Senior Week, seniors have the opportunity to participate in an ‘unofficial’ (ie. parents and teachers don’t need to know about it) Scavenger Hunt. The winners of the previous year’s tournament make up the list of items, each worth various points, for teams of students to find – ie. bar of soap from a hotel (10), Ouija board (45), a piggy bank that’s not actually a piggy (50), play ‘Twinkle, Twinkle’ on a toy piano and email the video (75), any comic book featuring Superman and dated before 2000 (50), put your name in lights (150), a picture of everyone on your team skinny-dipping (200), etc. Because nearly every kid has a smartphone these days, there are bonus searches sent via text throughout the competition like finding and taking a bubble bath in a local water fountain (200). Grand prize? A four foot Yeti statue, $300 and, best of all, bragging rights! For Mary, this competition means much more than fun and prizes. It means breaking out of her four years of being a supposed nobody at OPHS and finally making a name for herself – well, that and getting back at OPHS golden boy, Jake Bardone, the popular jock who’s made a high school career of working Mary’s nerves and harassing her gay bestie, Dez. Everything always seems to go Bardone’s way, including getting accepted into Mary’s dream college, Georgetown, which turned her down. Determined to win one for the underdogs of the world, Mary and Dez, along with their Harvard-bound nerd friend, Patrick, and laidback gal-pal, Winter, deem their team the ‘Also-Rans’ and hit the hunt hard! While the hunt propels the story, the real action happens with the participants as they navigate their feelings for each other. Y’see, Patrick is secretly in love with Mary, who has spent the past two years of her life crushing on Carson, who’s on another team with his girlfriend, Jill. Only, unbeknownst to Mary, Carson is cheating on Jill with Mary’s bff and teammate, Winter. Got all that? And then there’s Dez, who’s been Bardone’s punching bag since Dez dressed up as Daphne from ‘Scooby Doo’ for Halloween when they were in kindergarten - not the kind of thing future jerks of the world forget, y’know? Things only escalate and get more awkward for them all as the day and the hunt goes on – which is what makes it such a fun read…and great premise for a movie! What I personally like best about The Best Night of Your (Pathetic) Life is that while nothing overtly dramatic happens, the characters are as at-once obnoxious and self-involved yet likeable and funny as real teens. Mary’s stubborn and always wants things her way; Patrick’s clueless as to why girls don’t go for nerds like him (psst, Patrick, some of us do! ); and Dez insightfully points out that his friends treat him more as a cause than a friend – they’ll stand up for him to brutes like Barbone, but then they don’t actually talk to him about everyday things like his own boy crushes. This is Altebrando’s fourth Y.A. book, and one of her besties is Sara Zarr, the author of one of my favorite books from the past year, How to Save a Life. In fact, the two are now writing a book together called Roomies, which is set for a 2013 release. To learn more about Altebrando and her books, visit her website at http://www.taraaltebrando.com/ .